Despite a government ban on use of some common pesticides in agriculture, our food continues to be contaminated. The there-is-no-alternative factor, ie the absence of more acceptable substitutes, the cost factor and the easy availability of the pesticide leaves the farmer little choice. Regulatory bodies lack commitment, and research institutes have failed miserably. Why is the government napping? AFTER floods, droughts, earthquakes and several other natural catastrophes, India exposes itself to yet another threat, although of a different nature. Pesticides, or insect killers, are gradually spreading their tentacles into the human body. The government banned the use of dichlorodiphenyl trichloroethane (DOT) in 1986 and hexachlorocyclohexanc (HCH, which was formally referred to as benzene hexachloride-BHC) in 1997 for agricultural purposes. But there is lack of commitment on the part of the regulatory authorities in putting curbs on its use, or spreading awareness about its toxic effects among the farmers. All food commodities found in the Indian market contain pesticide residue. The total intake of organo-chlorine pesticides - DOT, HCH, aldrin, dieldrin, heptachlor and its epoxide and hexachloro benzene (HCB) - through food is 223 microgrammes (ug) per person per day in India. This is shockingly high when compared to the US where it is only 3.8 ug per person. I Ironically, pesticide usage per hectare in agriculture is only 570 grammes in India. This is far below that in the us (2.5 kilogrammes) and even other developing countries. In India, the bulk of the pesticide residue enters the human body through dairy products since these contain more toxins than the maximum permissible limit set by the World Health Organisation (WHO) and Food and Agricultural Organisation (FAO). It is the infants who are forced to bear the brunt of this hazard as their diet comprises either breast milk or dairy milk. In Delhi, for instance, infants consume 42 times more DDT than the acceptable daily intake norm of .005 mg/kg set by the WHO. Pesticides also enter the human body through agricultural prpduce like cereals and vegetables. These chemicals are immunotoxic and hence reduce an individual's resistance to infection. These toxic compounds are directly or indirectly involved in causing cancers such as Non Hodgkin's Lymphoma, soft tissue sarcomas, brain, liver, digestive system, kidney, testes and ovary cancer, neoplastic diseases, Parkinson's diseases, endocrine disruption and even reduction of sperm count. In India, the incidence of cancer has doubled in the last 10 years. Moreover, organochlorine pesticides are more dangerous than other pesticides as these bio-accumulate in human and animal tissues. Lack of regulation Realising the toxic effects of pesticides, the West was quick to ban its use almost two decades ago. In addition to the ban, food products were monitored periodically by market-based surveys to assess human exposure to these toxins. However, the Western nations continued to export pesticides to the developing nations through illegal channels. In India, the death of 100 people in Kerala due to consumption of imported wheat containing pesticide compelled the government to frame the Insecticide Act in 1968 under the ministry of agriculture. The Act was framed to regulate import, manufacture, sale, transportation, distribution and use of insecticides with a view to prevent risks to humans and animals. It calls for compulsory registration of insecticides at the Centra] level and licences for manufacture, formulation and sale at the state level. However, no serious effort, at the Central or state level, has been made to actually safeguard contamination of food products. There is no coordination between the various departments involved. Says K N Mehrotra, Indian Council for Agricultural Research (ICAR) professor of eminence (Retd), "The right hand of the government docs not know what the left is doing." What should have been a classical development for the "present and the future" and a prerequisite to assess the pesticide problem was not followed in earnest. Finally, the government banned use of DDT in 1986 and HCH in 1997 for agricultural purposes while allowing the usage of DDT for public health purposes, namely, combating malaria and kala azar. However, DDT finds its way into the farmers' market routinely because of it's availability and also because of the there-is-no-alternative factor. Says Mehrotra, "In a few places like Guntur in Andhra Pradesh and apple orchards in Himachal Pradesh, DOT is freely available." The regulatory laws have clear guidelines to take action against erring retailers but none of the officials have enforced laws stipulated in the Insecticide Act. "Pesticide industry not only has a strong lobby but also enough money since many new pesticides have entered the market bypassing norms of registration," he states. Moreover, farmers harvest the produce much before the waiting period (time required for pesticides to become negligible after application). Farmers say they are not aware of the waiting period and there is no one to educate them. A highly-placed official in the Central Insecticide Board, Faridabad, says: "All instructions are given on the packing," overlooking the fact that most farmers are illiterate and a different approach is required to make them understand. There is no regulatory agency to either enforce or prosecute offenders, says N P Agnihotri, All-India Project Coordinator, Pesticide Residue, India Agriculture Research Institute (IARI). Other factors that determine the farmers' choice are cost and availability. DDT is easily available in the market as it is sold for health purposes. 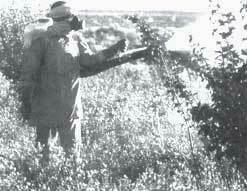 Agricultural officers never visit the fields to monitor the pesticide's use. Jaikaran from Samachana and Ranbir Singh from Gijee village in Rohtak, Haryana, say they have been using DDT since it is affordable and effective. Both were aware of the government ban and hence reluctant to name the source of their DDT supply. Sixty-five-year-old Gangarab from Mandella Kalan in Najafgarh, Delhi, says he buys DDT from the Block Development Office in Najafgarh. The crop output has increased after introduction of these pesticides, he says. About misuse of pesticides, he says, "Unless we are told about the drawbacks, we will continue to use in the belief that if a little is good, more will be better." Sunder, another farmer in Najafgarh, shares Gangarab's opinion. Many developed countries have a national pesticide policy which critically takes into account the ill-effects of pesticides in the long run. Mehrotra had suggested setting up of a similar policy typically oriented for tropical conditions; an independent body of experts which would set the guidelines for pesticide usage; and setting up of a scientific panel to scrutinize and coordinate various research activities. However, despite a colossal amount of literature available on the ill-effects and suggestions from concerned citizens, there is complete apathy on the part of the government.  No alternative pesticide or biopesticide, which is both affordable and harmless, has been developed.  It has been reported that mosquitoes can resist DDT but no alternative compound has been developed by the ministry of health.  Pesticides can be used only after registration by the government and registration is possible only when tolerance limits have been prescribed. However, out of the 146 pesticides, tolerance limits have been prescribed for only 50 pesticides.